Download a map of McLaren Park showing trails, major attractions, dog walking areas, etc. On Saturday August 24h, 5 p.m. to 7 p.m., we'll expore the park in the late afternoon light. before the return of the Winter rains. 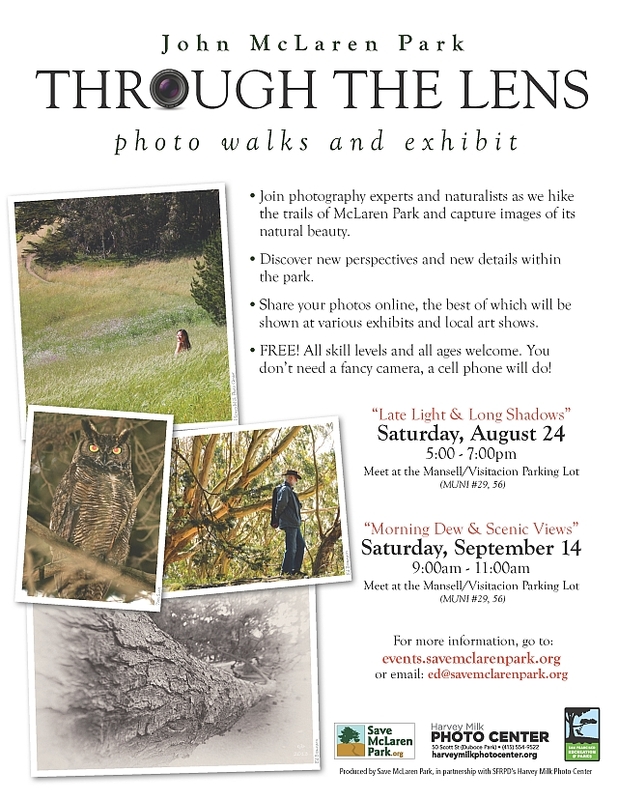 of McLaren Park and capture images of its natural beauty. Discover new perspectives and new details within the park. Learn techniques that will help you photograph them. Share your photos online, the best of which will be shown at various exhibits and local art shows. FREE! All skill levels and all ages welcome. You don’t need a fancy camera, a cell phone will do! Saturday, August 24, 5:00 pm to 7 pm. Meet at the parking lot at Mansell and Visitacion. MUNI #29, 56. Map here. This photowalk starts after the end of the second Saturdays in the Park concert, all about the blues, which takes place at Jerry Garcia Amphitheater from 2 pm to 4 pm. We'll meet at the Visitacion/Mansell parking lot, and explore the late afternoon light on the east side of McLaren Park. Make a day of it and enjoy the concert too! Pictures of people enjoying the park are as welcome as pictures of nature and scenery. We may encounter sunshine, wind, fog or all three, so dress in layers. Saturday, September 14, 9 am to 11 am. Check out the park in late summer to see what the months of dry weather did to the flora and fauna of McLaren Park. You'll want to recall this memory when our walks resume after the rains come; the changes they bring - and the speed with which they happen - are astonishing. We can have any kind of weather from glorious San Francisco autumn, to fog and wind, to one of our mini heat waves, so check out the weather before you come and dress appropriately. Don't forget sunscreen!